Japan has long been an important outbound student market, and a major sender to English-speaking destinations in particular. However, the narrative has been of a market in decline for some years now, and indeed the official statistics – whether from the Japanese government, UNESCO, or otherwise – largely bear this out. Japan’s Ministry of Education, Culture, Sports, Science and Technology (MEXT), for example, reports that outbound numbers have declined nearly every year over the past decade from an historic high of about 83,000 students in 2004 to 53,350 as of 2013. UNESCO figures tell a similar story, although with different annual counts, and we see the same pattern reflected again in Open Doors data from the Institute of International Education. The IIE reports that, while Japan remains the ninth-leading sending market for the US today, the number of Japanese students in America has declined in 13 out of the last 15 years. What MEXT, UNESCO, and IIE also have in common, however, is that in all cases the figures they are reporting are almost entirely concerned with higher education enrolments – that is, Japanese students who are engaged in longer-term university or college studies abroad. As we noted recently, the Japanese government has set a goal to double outbound numbers in the coming decade, and this move is likely to be an important driver of new growth in the Japanese market. In the meantime, some additional and recently released survey data provides a more comprehensive view of the Japanese market. These additional statistics highlight some significant areas of growth outside of higher education, and they suggest that the actual outbound mobility from Japan is roughly three times what the official MEXT statistics would indicate. In January 2016, the Japan Association of Overseas Studies (JAOS), in cooperation with the Japan Student Services Organization (JASSO), set out to compile a more complete view of Japanese students abroad. A survey of JAOS member-agencies, in combination with additional data from JASSO, estimates that a total of nearly 173,000 Japanese students went abroad in 2014/15. As the following chart illustrates, this revised total includes the 53,350 students reported by MEXT for 2013, as well as 52,132 students tracked by JASSO for 2014, and a further 64,988 students referred abroad by JAOS members in 2014/15. JAOS’ confidence in these revised estimates stems partly from an expectation that there is little overlap among the JAOS, MEXT, and JASSO student pools. 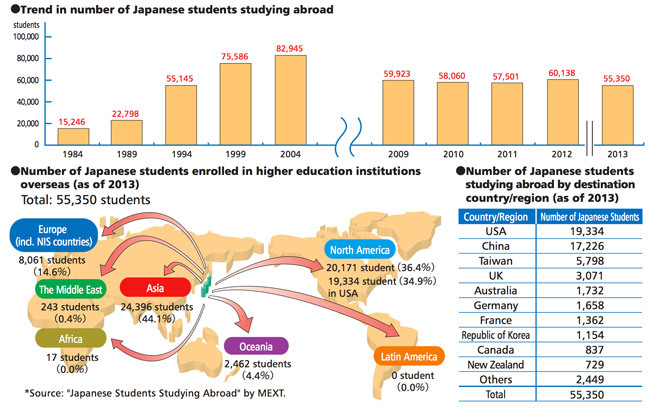 Where MEXT is primarily concerned with higher education enrolment, JASSO’s numbers largely reflect Japanese university students pursuing short-term exchange programmes abroad (most for six months or less). The JAOS student pool, meanwhile, is largely composed of students going abroad for language study as well as those pursuing secondary school overseas. JAOS finds that student demand is still very concentrated among leading English-speaking destinations. The US remains the leading destination for language, secondary school, and university students, with both the UK and Australia among the top five destinations. China is the second-ranked destination for higher education, after only the US. But all of the top destinations for language study and secondary school are English-speaking: the US, Australia, Canada, the UK, and New Zealand. Interestingly, the Philippines is now the sixth-leading destination for language studies, as reported by JAOS members. There are nearly 5,000 Japanese students enrolled in language studies in the Philippines currently, with that growth being driven largely by the affordability of English programmes in the Philippines as well as its proximity to Japan. JAOS reports that short-term language study abroad (i.e., three months or less) remains the core area of demand among Japanese students, and that more than half of the nearly 65,000 students in its 2014/15 count fell into this category. Another 20% of the students referred by JAOS member went abroad for junior high or high school programmes that same year, and about 14% chose volunteer, internship, or working holiday placements. This entry was posted in Asia, Japan, Regions, Research and tagged student recruitment, Teaching English as a Foreign Language, international student mobility, International student recruitment, universities with international students.